ME – The screenings. The ideas behind them. Ah, she says. She gets it. How can I help? ME– Write it for me? I can’t, she says. But I *can* bring stuff for lunch. I can throw you the pātai. You know the story. I'll hum it, with the questions, and you play it with the answers. So she arrives – as always – with (reusable) bags bulging with kai. Opens the fridge. 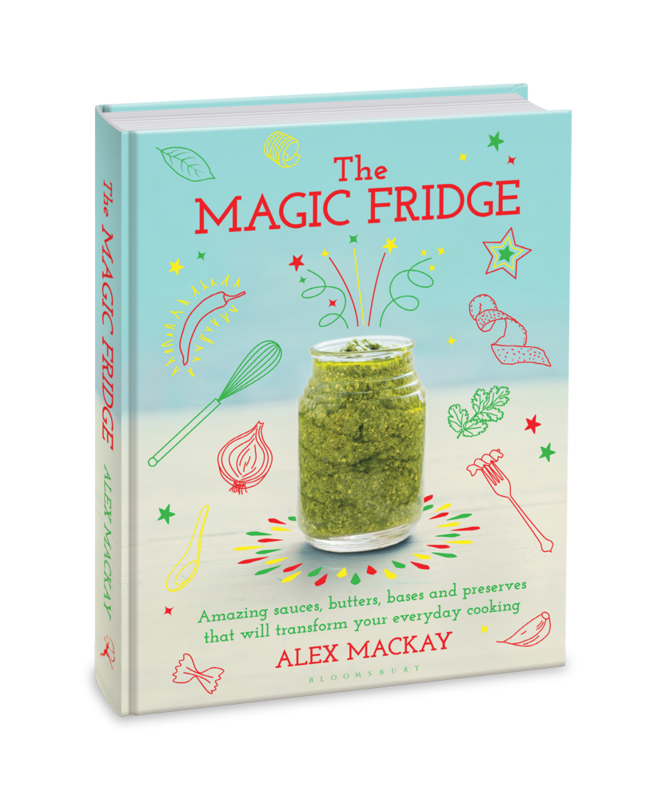 Mutters about its miserable contents. Unloads her bags. Makes a pot of tea. Settles herself in a sunny chair. Switches off her phone. Hums. Watches me power up the desktop. One two three go, she says. What’s on the programme? 1B–Early lunch is *not* your kaupapa. ME– There are seven screenings, accompanied by discussions with directors. A pilot programme. Hang on, I'll paste it in. She puts down her mug, gets up, puts on her elegant reading specs. I'm easily distracted. I want to be distracted. They're new, I say. Nice. She ignores me. Comes over. Leans on my shoulder. I staunch up. Paste in the info. Beehive Theatrette, Parliament, kindly hosted by Associate Minister for Arts, Culture & Heritage Grant Robertson. Guest list now closed. 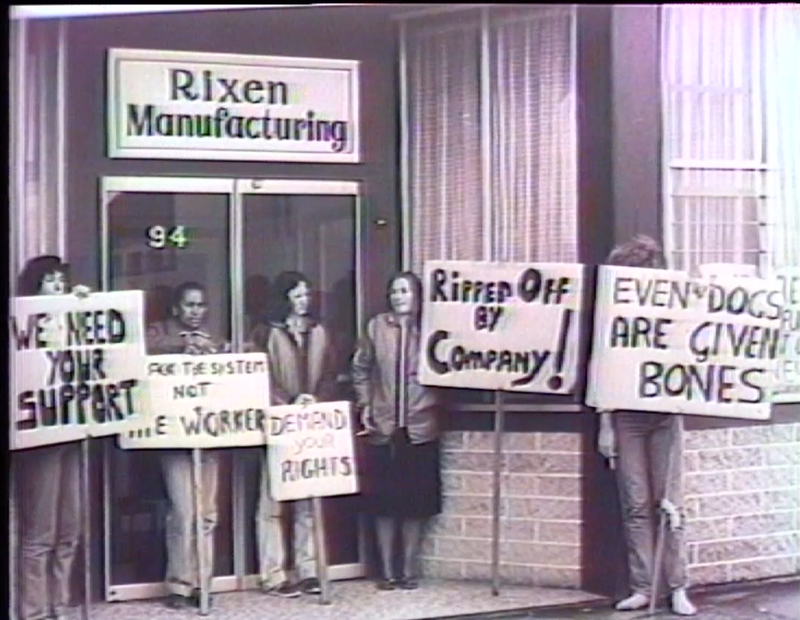 Even Dogs Are Given Bones (EDAGB) documents a group of women workers during their 11-week occupation of the Rixen clothing factory in Levin, after its owner made them redundant and closed the factory without giving them redundancy payments. 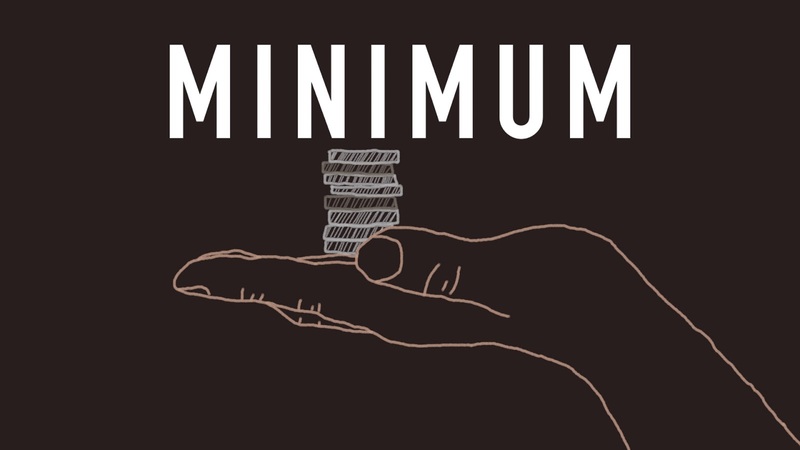 Minimum is a series about women who work low-wage, precarious or under-appreciated jobs in Aotearoa. Te Auaha cinema. CLICK HERE to book a seat, with your PayPal account. Followed by Q&A with co-writer & director Wanuri Kahiu, led by Ness Simons, writer/director of the hugely successful Pot Luck webseries and Head Tutor at the New Zealand Film & Television School. with Wanuri present and followed by a discussion with Wanuri, led by Kiritapu Allan, M.P. and Junior Whip. Beehive Theatrette, New Zealand Parliament, Pipitea, hosted by Jan Logie with Grant Robertson as a guest. Invitation only, but feel free to ask for an invitation! 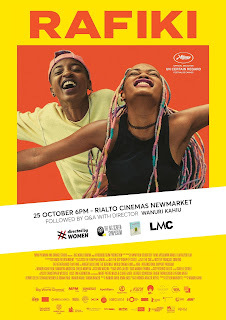 #directedbywomen #aotearoa's response to Wanuri's FUN & FIERCE & FANTASTICAL Afrobubblegum ideas directed by Anna Duckworth, Hanelle Harris, Jessica Hansell, Ness Simons, Roseanne Liang and The Candlewasters. Conversation with some of the directors to follow, led by Louise Hutt, herself a writer/director, and author of the ground-breaking Online Heroines research. Rialto Cinema Newmarket, bookings online here. Followed by Q&A with director Wanuri Kahiu and Ella Henry. Rialto Cinema Newmarket, CLICK HERE to book. She gives me a little one-arm hug. 1B – Ākene pea. Ka rawe. But. ME – I want to celebrate these directors, within the Directed By Women global celebration that reaches beyond ‘the industry’, to audiences for films that women write and direct, *and* within Suffrage125. I want to amplify the audiences' pleasure by having the directors present to talk about their work, in the cinema in person or through the magic of live Skype. And I want to provide a craft-oriented and feminist context, where – if they want to – directors can talk about why and how they made the work and how systemic obstacles affected the film; and what that meant for the film. And I’ve talked with so many women in various contexts, lots of them feminists, who choose their reading matter according to the gender of the author, but often cannot name a woman director beyond Jane Campion or someone similar and certainly do not have a favorite woman director. I hope, that if they/we are exposed to more women-directed work PLUS director-led conversations about it, more women will start looking at who directed the movies they’re offered in cinemas and online and take note of their differences. Some of the work will be just like the men’s work we’re used to. But a lot won’t. 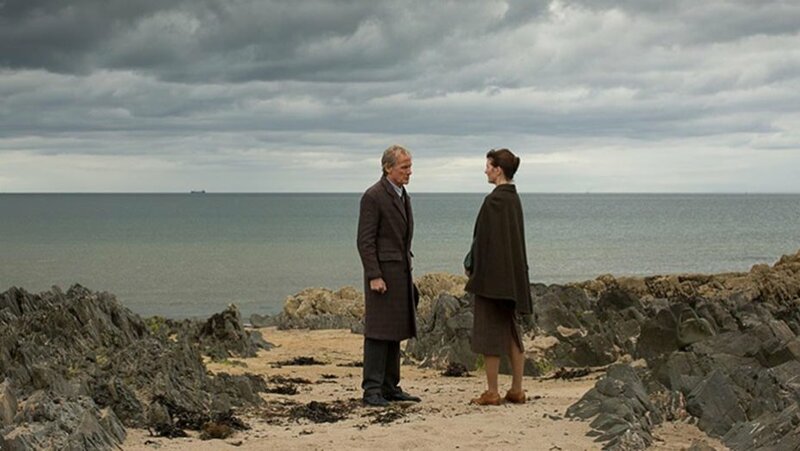 In the UK, Club Des Femmes is a good model for celebrating women-directed movies. There are many women’s film festivals too. But there’s room for a lot more activity. 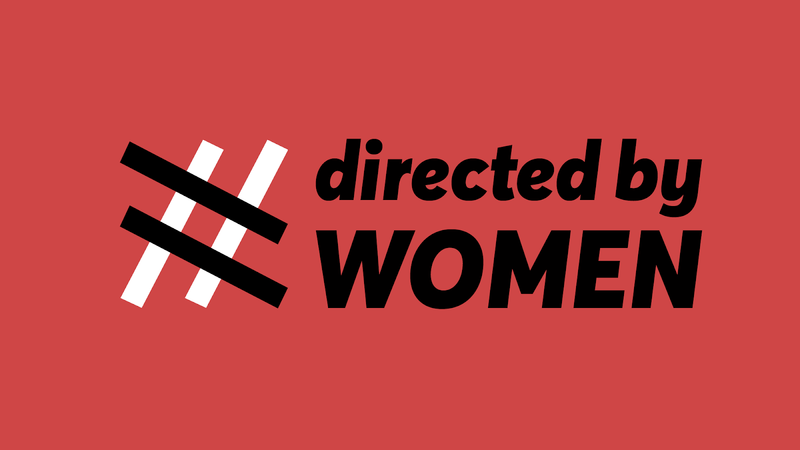 1B – So #directedbywomen #aotearoa is a fragmented kind of film festival? ME – Yes, and mostly in pop-up contexts, to make the work accessible to those who can't afford film festivals: students and emerging filmmakers and others on low incomes. 1B – But the Rialto screenings will be at normal prices? ME – Yes, alas. I hoped to organise subsidised tickets, as Ava DuVernay and Oprah Winfrey and others do in the States. But ran out of energy and time. 1B goes back to her sunny chair and her tea. 1B – How did you choose them? ME – I thought about films that would provoke discussion and action. Films directed by women whose work and presence in the world delight me. Isabel Coixet was a no-brainer, as a prolific Catalan/Spanish writer & director and often her own camera operator. 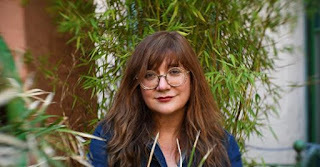 Her work includes award-winning features, documentaries and commercials and her personal work has complex women protagonists and often incorporates human rights themes. She was a good friend of John Berger, the legend whose writing revolutionised ideas about looking at and portraying women. She's also now in post-production on Elisa y Marcela, for Netflix, about two women who attempt to marry at the beginning of the twentieth century and a member of Spain's powerful group of activist women directors and president of the influential European Women's Audiovisual Network. She has stories to tell and wisdom to share. The Bookshop is about women and work and the problems we face, so is a great choice in the week that Even Dogs Are Given Bones and Minimum will show at Parliament. And the actions of a girl in The Bookshop point to the kind of hope for the future that I feel thanks to the work of filmmakers like Kathleen Winter who directed Minimum and her DOP, Jess Charlton. Rouzie Hassanova's Radiogram is here thanks to Lucy from the Emerging Women Filmmakers Network, who told me about the film. A tiny group of us watched it and were blown away. It is so beautiful. And timely, with its theme of freedom – a theme shared in all the work selected – including freedom of expression. And then those webseries. Aotearoa’s women directors thrive online. 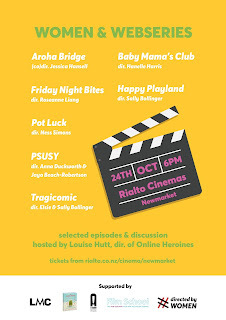 Women & Webseries celebrates their work, with (I know I'm repeating myself!) a fierce, often funny and feminist selection. What's not to love? I loved Wanuri's FUN & FIERCE & FANTASTICAL Afrobubblegum ideas! She's inspiring. 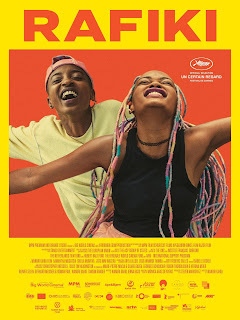 Rafiki is totally special and its journey into the world is fascinating. I think there are also parallels between what colonisation and Christianity did to gender and sexuality in Kenya and what they did here in Aotearoa New Zealand. I like it when she smiles at me. I smile back. 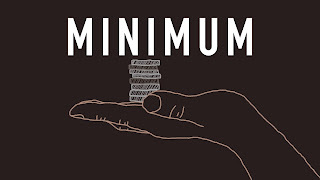 1B – Are there really many women who have disposable incomes and choose to buy books by women authors, but who don't choose movies and small screen viewing that women? ME – Oh yes. Lots. I became aware of some of them in a gender symposium a while back. But they're also you and me. 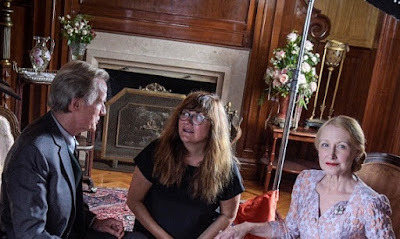 None of us has been exposed to a critical mass of women-directed screen work unless, like Barbara Ann O'Leary of Directed By Women, we've made a conscious choice to watch only or primarily work that women direct. So we miss out. For instance, Delphine also told me that her feminist ideas and their realisation in her work were shaped by reading women's books; and after reading Virginia Woolf etc she was unable to read men like Balzac and Proust in the same way. But all her filmmaking influences were men, until she came across Andrea Arnold's work; and Celine Sciamma's. 1B – Do women's experiences of filmmaking matter? Isn't it hard for every filmmaker, regardless of gender? Doesn't the work just speak for itself? ME – Yes and No. You're pushing me, babe. There's real pleasure when we watch diverse women's authentic portrayals of women and girls on screens large and small; and their stories about the lives of men and boys. You know that. And EDAGB, Minimum, The Bookshop, Radiogram, Rafiki and the webseries episodes all demonstrate how fresh and different and inspiring and deeply moving that experience can be. But you also know that women have particular problems within systems that show minimal confidence in our self-representations and our world views and the stories we choose to tell; where 'they' (sometimes other women) try to mould our stories so they fit what they're used to, where 'they' decline to invest in them. Where 'they' try to persuade us, persistently, that it's our fault and we just need more confidence and a few more workshops, to bring us up to speed. We've talked about this before. Does anyone say to an aspiring sports player, 'You need more confidence'? Sometimes, maybe. But mostly what they say is 'Practise. Practise. Practise'. And they make sure the sports player gets the individualised support she needs. There may be workshops involved and coaching, all kinds of stuff, but basically it's about supporting the player to do what she needs to do to shine as a unique player, and in a team if it's a team sport. 1B - But I just watched Jacinda Adern and Helen Clark talking about confidence as a problem, even for Aunty Helen? ME - Yes. I saw that too. They also spoke at length about domestic violence as a major problem and about the need to establish equal pay. It surprised me that they didn't really connect women's felt 'lack of confidence' to our lived experiences of systemic gender discrimination and expectations. This woman is now an established professional screenwriter and continues to work on her own projects too. Because of her inner drive, her fervent desire to tell onscreen stories and her commitment to become an expert at doing that. Not because of her confidence or because she attended lots of workshops intended to 'upskill' her. Finding time and resources were her biggest issues, as they've been for artists forever. And like many other women, her early career needs for time and resources will have been affected by pay inequity and/or (though not for her, I think) by the effects of our unpaid work on our capacity to practise. I'm sure that the systemic lack of confidence in us - NOT our own confidence or lack of it, though we have every reason to lack confidence when we enter systems that are biased against us – is a key element in the deep-seated gender discrimination that causes so many problems, like those highlighted in #metoo. Isabel's said that to get a start in the film industry as a woman in Spain, you have 'to be a thousand times more pushy, tough and determined than any man'. Rafiki's been banned in Kenya because of its story about two young women who fall in love and Wanuri now has to take action against the Kenyan government if the film – which was selected for Cannes and Toronto – can be eligible for consideration for Best Foreign Language film at the Oscars. The systemic lack of confidence and investment in our work, from development to distribution to the archives, has so many effects. It actively sabotages opportunities to see women's work. For example, I've often wondered if, when film fests talk about 'quality' and women's films, they're partly talking about production values that are only possible with big budgets. I wish they'd focus more on the quality and imagination of the storytelling by diverse women who are the experts on our lives. And they might, now some of them have signed up to run their festivals with gender parity. 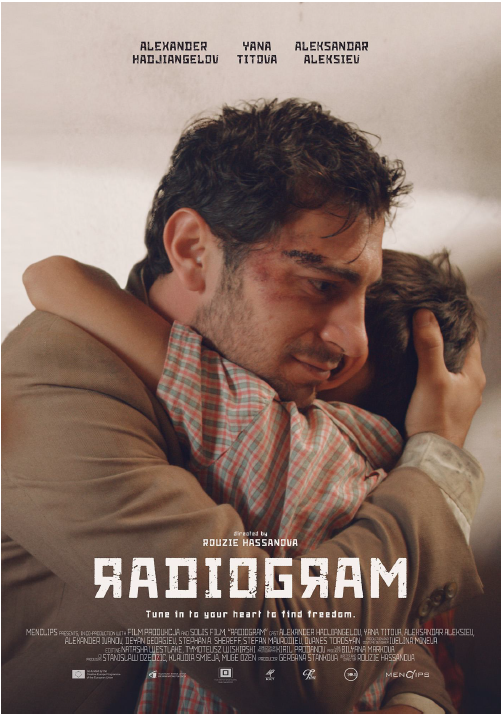 I didn't notice that Radiogram was a low-budget film, because I was transfixed by its power and beauty: you'll love it for the script alone. But Rouzie had to shoot Radiogram for 130,000EUR plus 35,000EUR for music rights; some of the production values affected by the limited budget will have reduced her opportunities. Webseries women directors too show such quality and imagination in storytelling, using small budgets and big imaginations to represent women in ways we just don't see otherwise in the cinema. So I was very interested when someone at New Zealand on Air didn't get this and was mystified why episodes of local webseries might provide a 'cinema experience'. 1B – You're upset, kare. 1B shrugs. Shakes her head. 1B – No violins, Eeyore. Is there some good news? ME – Let me think. We could have just a little something? I ask. Something from that cake box and some kawakawa tea from the garden? I hold my breath, watch her realise that 'a little something' would be good for both of us. So we potter round the garden picking bits of this and that, for now and for lunch. And eat special little chocolate and raspberry friands from French Cancan in Newtown. And I'm good to go again. 1B settles back in her chair, trying to be patient. She still has to buy something to wear at her posh dinner. It will take her ages. 1B – And we're off! ME – The good news. At the annual Big Screen Symposium three years ago Chelsea Winstanley called on the New Zealand Film Commission (NZFC) to distribute its funds equally between women and men, the first woman director/producer/writer to do so, supported by other Māori women filmmakers. Remember? Since then, others have joined her. That call hasn't ended. And there's been #metoo, followed by the excellent work of SWAG - the Screen Women's Action Group, working to make our industry safe from sexual harassment. And I'm delighted that Anna Serner of the Swedish Film Institute is coming to this year's Big Screen Symposium; she's the world leader in creating gender equity in taxpayer-funded film organisations. Change is happening. But it's slow. And it's focused within the industry. 1B – Why can't you just do what you're doing now, on a larger scale? I laugh. And talk as fast as I can, while my fingers fly across the keyboard. ME – Cost Including cost of time. Lots and lots of searching to find EDAGB for instance. And So Many Emails About Everything... And so much Generous Voluntary Help from others that they wouldn't be able to sustain in their busy lives. Director and writer and academic and artist and activist Louise Hutt is an amazing support. Writer/director Ness Simons at Te Auaha has been amazing too, though she's also flat out as head tutor at the New Zealand Film School, doing outstanding work to support her students to become the best human beings they can be, as well as the best filmmakers they can be; the women and men who've been through that course are special. Kathryn Bennett at Rialto Newmarket has been uber-generous too, patiently explaining how the system works. Jill McNab at Vendetta has provided excellent advice. Patricia Watson at WIFTNZ is a gem. The New Zealand Film Commission kindly helped with a contact and opened up their beautiful little Hayward Theatre for a test screening. The women at Big Screen Symposium have really gone for it to get Wanuri here. Screening Rights The cost of screening rights is impossible to recoup if tickets are to be affordable and if the cinema (like Te Auaha) is small. And Te Auaha's lovely 55-seat cinema is essential because most cinemas can't yet manage live Skype and because its size is just right for intimate conversations. The costs for films not otherwise distributed in New Zealand and for one or several screenings, even in a larger cinema, are particularly uneconomic and not always negotiable. Labelling/ Classification Getting films labelled through the Film and Video Licensing Board (FVLB) – or in the case of the webseries episodes, each episode! That labelling isn't necessary for docos and the FVLB appears not to be interested in the argument that almost every woman-directed film *is* a doco, because it shows us women as we are, rather than as we are constructed through lenses controlled by men. Travel Costs for directors and fees for them to speak or to interview other directors, which I haven't paid this time but which they utterly deserve. Freight Who’d have thought it would take a full day to organise a FedEx pickup from Korea, for the DCP (Digital Cinema Package) of Rafiki? That FedEx would cost so much more than NZ Post? And that it would take hours and hours to prepare the paperwork to send it through to the next festival? Travel Costs for directors and fees for them to speak or to interview other directors, which I haven’t paid this time but which they utterly deserve. 1B – You could get funding? 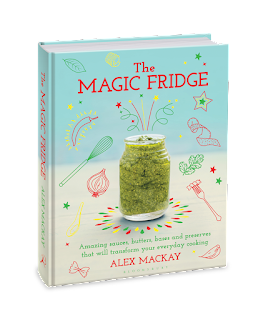 From the NZFC? NZOA? WIFT? This time, Women's Suffrage? From human rights lawyers interested in freedom of speech, especially in Rafiki and Radiogram? ME – Tried all that. No success. Maybe another year. I've been asking directors and writers and editors and cinematographers which films they would like to see, with the opportunity to do a Q&A with one of the filmmakers after it screens. And the list is already quite long and very exciting. In the meantime, I'm just hugely grateful to all those who helped and continue to help. What a lovely combo of logos, huh? ME – And today I have one! As well as the book of course. Kia ora e hoa. Ngā mihi nui, ngā mihi tino mahana ki a koe. I'm done. Let's have lunch. And we plant some silver beet. Then off we go to find 1B the perfect frock. My head preoccupied with those questions for Isabel.